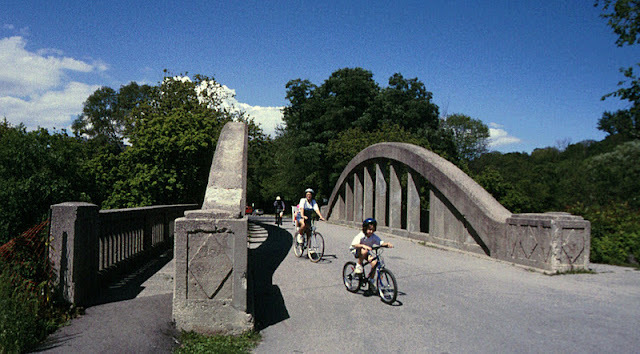 We'll finish our exploration of arch bridges in Toronto with a look at another reinforced concrete through arch. The Charles Sauriol Bridge is similar to yesterday's Pottery Road Bridge, except the concrete hangers aren't flared, there's a sidewalk extending outside of the arch, and the ends of the arch are protected with short, decorative walls. Toronto's Bridges: Charles Sauriol Bridge by Mark Yashinsky is licensed under a Creative Commons Attribution-NonCommercial-ShareAlike 3.0 License.